Only 25 percent of all respondents think that their retirement will be better than previous generations'. More than nine in 10 Americans not yet retired anticipate their retirement expenses to be similar to or less than pre retirement spending. And more than one-third of pre retirees (39 percent) have not yet started saving for retirement, according to a new report. Franklin Templeton Investments disclosed these findings in its 2014 Retirement Income Strategies and Expectations (RISE) Survey. The annual survey, which polled 2,011 Americans ages 18 and over, found that the concept of retirement is laden with contradictions in both attitude and preparedness. On the bright side, 72 percent of pre-retirees indicate that they are looking forward to retirement. However, only 25 percent of all respondents think that their retirement will be better than previous generations’ versus 33 percent who think it will be similar and 41 percent who think it will be worse. Even with improving economic conditions, more people are concerned (48 percent) about outliving their assets or having to make major sacrifices to their retirement plan today than they were at the beginning of last year (44 percent). The results show a significant gender gap in overall attitude and concerns toward retirement. By a ratio of 3:2, women are more likely to respond that they are not very confident with and don’t really understand their retirement income plan. Men more frequently said they think their retirement will be better than previous generations’. Men and women also differ in their approach to retirement. For example, the survey found that men are slightly more likely to consider the needs of their spouse, while women are more likely to consider their own needs and those of their children and grandchildren. The survey uncovered differences in retirement outlook, based on age. The younger the respondent, the earlier they expect to retire. 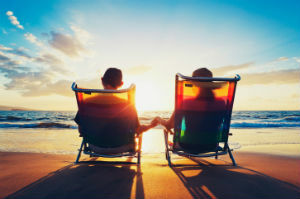 When asked what they would do if they were unable to retire as planned due to insufficient income, “retire later” was the top response among the possible adjustments pre-retirees would make.